When it comes to cruising, there’s a lot more to packing than simply tossing your favorite outfits and accessories into a suitcase, especially when you’re going on a world cruise that could last 45-100 days or more. 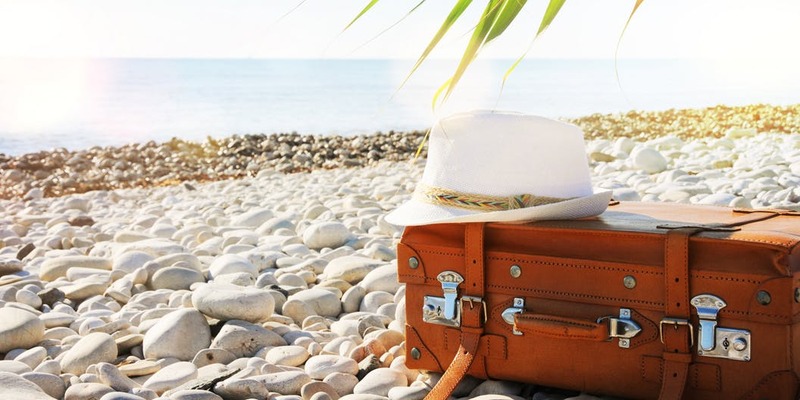 Several factors affect what to bring (or not bring) on your global voyage – including onboard events and theme nights, cruise ship dress codes, changing weather conditions, excursions and port activities, cultural and seasonal subtleties and more – all have an impact on what to pack for a world cruise. To help you ensure you're perfectly prepared for your globe-trotting experience, our CruiseInsider experts have compiled a list of essential packing tips and tricks, including a helpful world cruise packing checklist that will make packing a cinch. 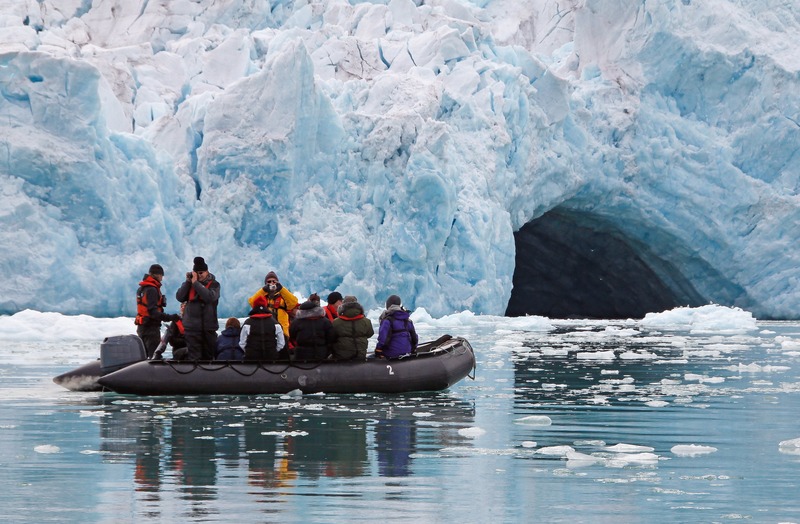 World cruises visit dozens of destinations in one continuous voyage. Packing the right way for a world cruise isn’t something for procrastinators. Lengthier sailings like world cruises or grand voyages require a bit more preparation and thought than a typical cruise. Resist the urge to pack at the last minute. If you do, you’re bound to rush, which means you’re also bound to forget something important. Insider Tip: Review every detail of your itinerary or ask your advisor before you even begin the packing process. Theme nights, restaurant and nightlife options, and other available onboard activities will influence what you should pack and what can stay at home. Packing well ahead of your departure date is one thing, but knowing exactly what to bring is usually what confounds so many. First, find out if there will be any formal nights or galas aboard that may require tuxedos or gowns. While many world cruises these days are more informal, with even jeans acceptable in many ship dining rooms, you’ll probably need at least an outfit or too that’s dressier, like suits for men and cocktails dresses for the ladies – think “little black dress.” Special theme nights are relatively common on world cruises as well, and may require you to dress accordingly. Start organizing the essentials and packing your luggage several weeks before it’s time to go, giving you some extra time to shop for items you don’t already have. Packing well advance gives you peace of mind as you plan your vacation. Then a few days before you depart, all you have to do is organize and add anything else you want to bring. Use our helpful checklist below so you don't miss any essential items or create your own list of what's necessary well in advance. 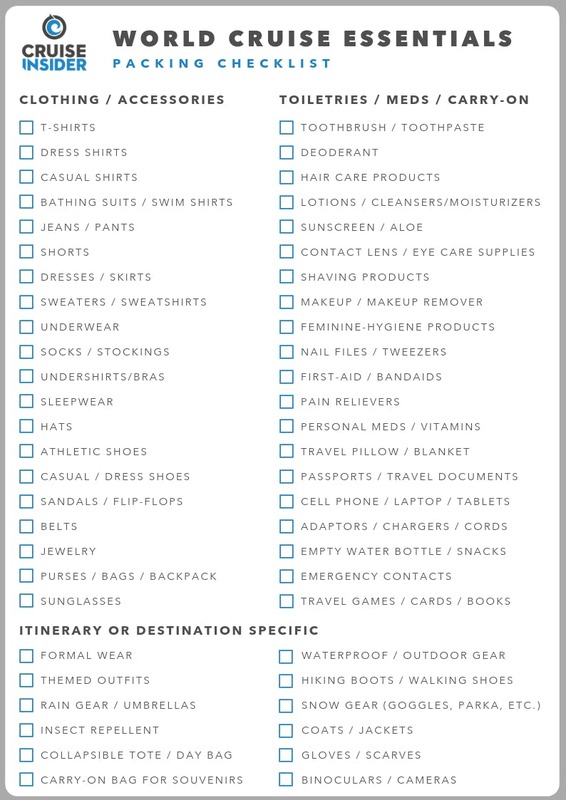 Download or print our helpful world cruise packing checklist. Veterans of world cruises have learned that packing a variety of interchangeable outfits is a must. While laundry services are typically available on every world cruise voyage, minimizing the hassle of doing laundry is the key to a relaxing vacation. Pick a few color schemes that make it easy to mix and match outfits, changing them up with various accessories, so you have a variety of options. Don’t forget, you’ll be visiting dozens of destinations, so you'll also have the opportunity to picking up clothes, accessories and more as you sail the globe, great for practical use as well as providing souvenirs of your trip. Insider Tip: With so many exotic shopping opportunities available as your cruise around the world, bring an extra bag with you or make sure you leave a little extra room for any souvenirs you pick up during your travels. As you pack for your world cruise voyage, consider the regions of the world you’ll be visiting and the time of year you'll be there. Tropical destinations usually mean beach casual and swim suits. In colder locales you'll need layers - jackets and sweaters - or outerwear depending on the cold-weather activities. Ports in Europe typically require more resort-casual attire. Plan in advance for weather changes and activities in specific destinations. If you’ll be visiting any religious or cultural sites on your world cruise, you’ll want to have some modest clothing to cover your shoulders and knees. Sturdy walking shoes are important for any type of cruise as there will be lots of walking both on the ship and excursions in ports. For this adventure of a lifetime, don’t forget extra supplies of personal hygiene and beauty products that may not be available in foreign destinations. If you wear eyeglasses, bring an extra pair. Need specific medications? Make sure you have an ample supply. The ship is going to be your home for quite some time on a world cruise, so you may also want to bring items that make your stateroom feel more like home, such as pictures of friends, family or pets. > Click here to read our helpful article about handy extra items to bring on your next cruise - crucial items that most people miss! No matter how long you’re away or what type of travel you’re doing, packing light can make for a much more comfortable journey. Not only will you have less to lug around, you’ll also have more space to move in your stateroom. Pack light and pack layers to maximize space. If you’re the type that tends to overpack, try laying out all the items you think you’ll need first and then pack half that amount as a starting point. Aim to choose pieces that can be worn multiple times or can be mix-and-matched within your wardrobe. Insider Tip: World cruise ships typically offer dry cleaning and laundry facilities. Some include affordable self-laundry service, or you can save on costs by packing some travel-size detergent and lightly washing certain items in your cabin’s bathroom. Rolling your clothes rather than folding them helps save precious space and can prevent wrinkles, too. Heavy winter clothes take up a lot of room, so keep that in mind as you pack for multiple seasons and locations. We recommend sturdy, lightweight suitcases and carry-ons that are efficiently packed to maximize fairly limited space onboard but still provide you with enough options. Pack simply and strategically for your World Cruise. The suitcases should be big enough to fit at least 10 days of clothing, yet small enough not to rack up oversized charges with the airlines. Be sure to save some room for souvenirs as well. If you’re limited on space, bring along an empty, foldable duffle which can be used for newly acquired goods. Insider Tip: Pack a carry-on overnight bag that contains your essentials just in case your luggage gets delayed or lost. Include things like prescription and over-the-counter medications, travel documents, must-have toiletries and a change of clothing for good measure. With a little forward-thinking, a lot of organization (and some help from CruiseInsider), you can make the daunting task of packing for a world cruise into something simple, and very doable. Once properly packed, all that's left for you is to enjoy your once-in-a-lifetime voyage! If you’d like to learn more about world cruises or have any questions that we didn’t already answer here, connect with a CruiseInsider expert today at (877) 734-68508 to start planning your next dream vacation.